When you read about something in a text book, it often has a "remote" feeling, but going and visiting can really make something come alive. Sometimes, you also learn things you never knew before - things that aren't deemed "important enough" to make it into books. For example, did you know that Hannibal Hamlin, Abe Lincoln's first Vice President, spent the summer of 1864 helping defend his home state during the Civil War? We didn't know this either -- we learned it when we visited Fort McClary in Kittery, Maine. It's easy to read about Gettysburg, but it takes on a new meaning when you stand at the edge of Pickett's Field, imagine the last-ditch surge of fighting that came at the end of the three days of battle, and really feel the history in your soul. 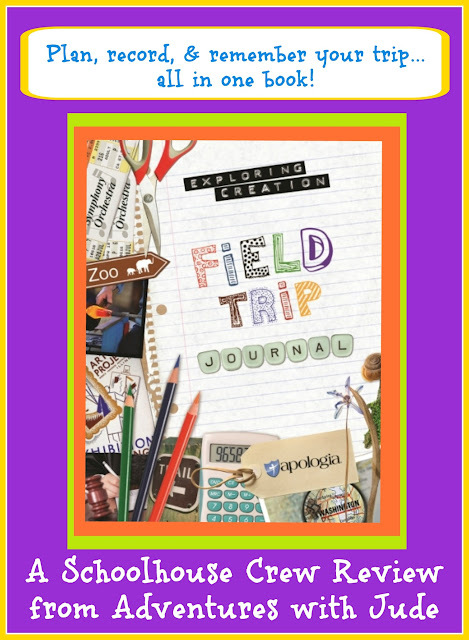 To encourage learning through hands-on field trips, Apologia Educational Ministries has created a special resource, the Exploring Creation Field Trip Journal. This 64-page spiralbound book is a fantastic addition to your field trip. 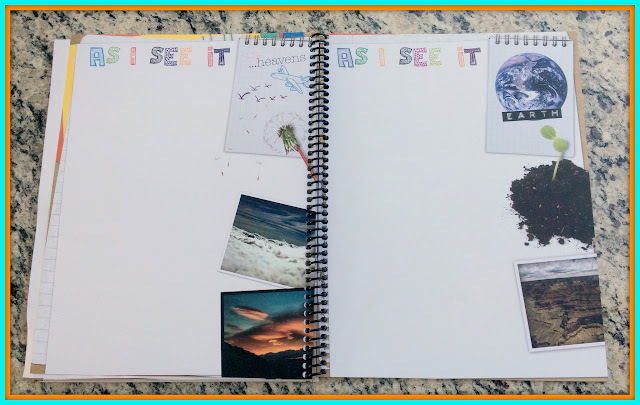 It's perfect for homeschooling trips, but it also can be a planner and journal for a non-homeschooling family who enjoys traveling. The book is divided into 9 sections, to make both planning and recording your field trip easy. 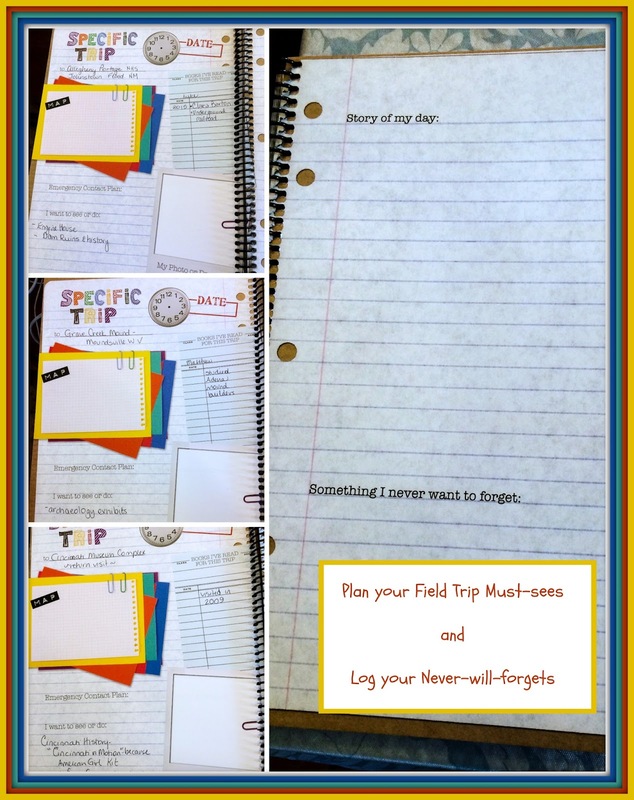 One of my favorite sections is a two-page spread with 100+ field trip ideas. It divides field trip ideas into "categories," - beginning with broad topics - plants, animals, history, culture, etc. - and then sub-divides these into places that are great for learning about them. Of course, you have the obvious suggestions, such as museums, aquarium and zoos, but they are followed by some ideas that you wouldn't have though of - or at least that I hadn't thought of! For example, a trip to a garden nursery. It sounds more like an item on a to-do list, but it is a great place to study different plants in person. Many small nurseries also will pre-arrange a short tour of the grounds so you can learn about native and non-native plants, or you can check their webpages to see if they offer specific classes. We have a local nursery that does offer monthly classes about plants, but in the spring, the owner also offers classes on Pisanki (a Polish Easter egg dying technique.) The journal also suggests some that seem really "out there" -- literally! How about a trip to the International Space Station? Ok, so maybe you're not ready to hop a space shuttle, but you could take a virtual tour. A virtual field trip can be just as exciting! Also included in the "Trip Prep" area is a web link to some fantastic resources and ideas for trips. Next, there are two maps - one of the United States and one of the world. 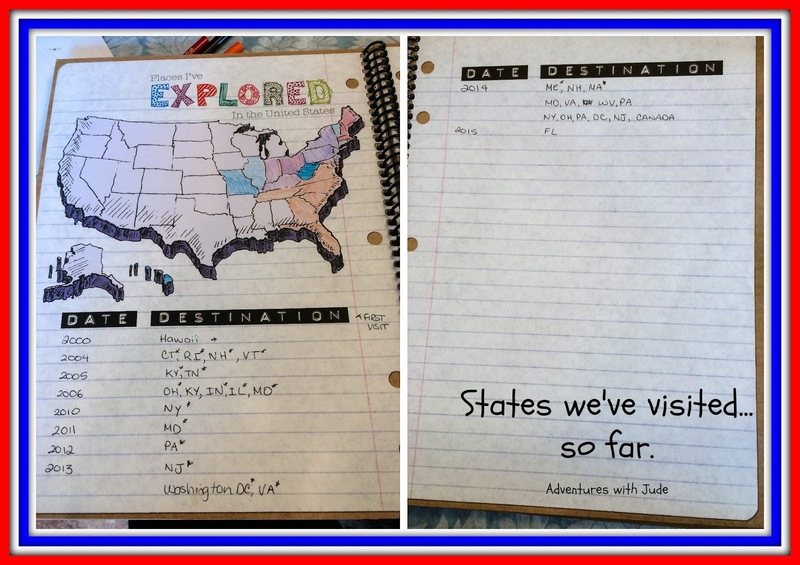 When we got our book, we decided to color in each state we had visited. 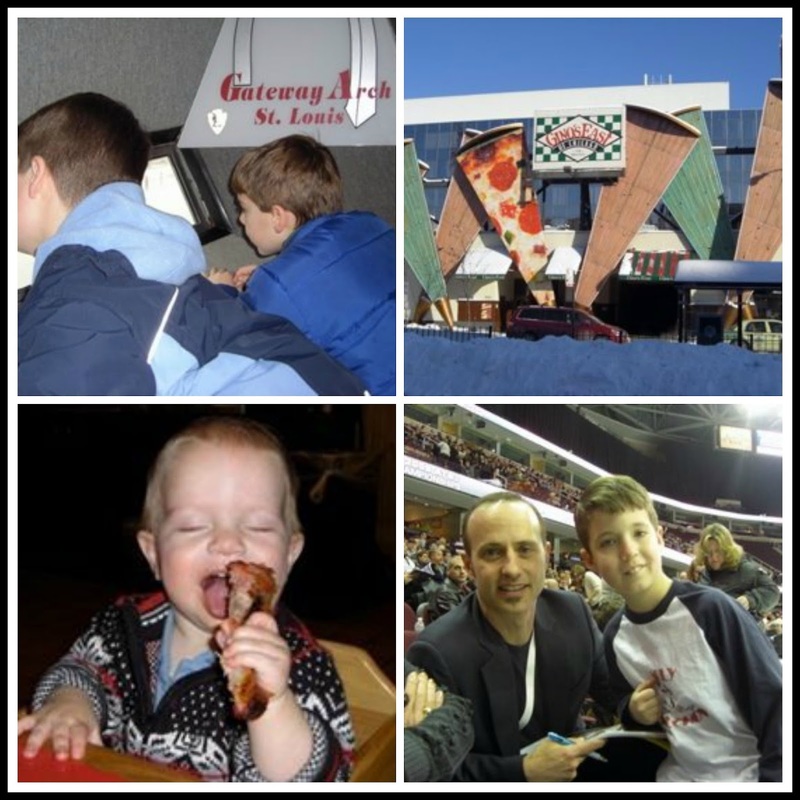 Thinking back on on the places we had been to on our "first trip" to a state was a nice trip down memory lane. In 2004, we visited New England for Luke's birthday, and the 2005 states were added during another birthday trip. The 2006 trip was mainly to Ohio to see doctors for Celia, but we always laugh how the one day we had off from appointments and decided to go to Indianapolis. We got there and decided we didn't feel like going to the children's museum, so we decided to go to Illinois for lunch, just to say we had been there. A couple of wrong turns later, we found an overhead sign that said "To Chicago." Neal and I looked at each other, shrugged and said, "Let's go get a pizza!" With nothing better to do than sit in a hotel room and wait for morning and more doctor visits, we drove to Chicago, ate a pizza, and drove back to Cincinnati. Between other visits, we went to St. Louis, MO and went up into the Arch and got some pretty good BBQ. When we realized the US Skating Nationals began the day we were supposed to leave Cleveland, we just added a day to our trip so skater Luke could experience the men's short competition. He got to meet one of his heroes - a very gracious Brian Boitano. Admittedly, it was not a fun reason for a trip (we visited two different hospitals), but it's not the hours in hospital and waiting rooms that we really remember -- it's the time we spent together. 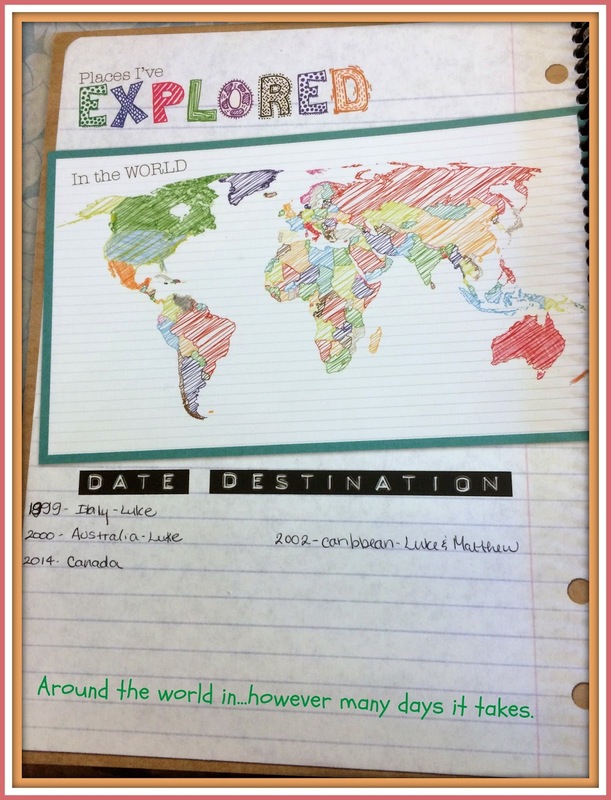 There is also a "World Traveler" Map. 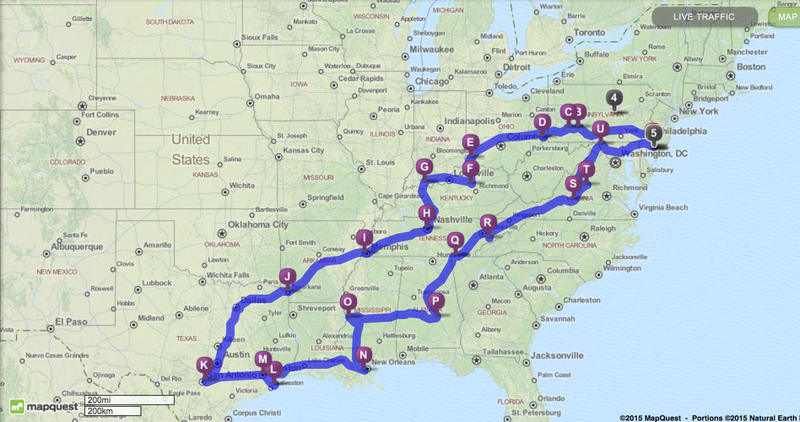 We're planning a ginormous field trip this summer, and we've titled it "The Great American History Tour - Round Two." Last year, we took two shorter trips - first through Central MD and Central/Western PA, then to New England - spending about 10 days on the road. Even when we hosted our Aussie family, we never spent more than a week away from home. This year, we are taking a big plunge and doing one ginormous three-week trip. When Neal asked me where we were going, I said, "Monticello, Virginia...via San Antonio (Texas)." Of course, with five opinionated siblings, not everyone is going to love every stop. However, we tried to include enough so that each person has something he or she "chooses" every few days. What I did was ask each child what she/he wanted to see at "his/her" stop. Luke chose his must-sees for Allegheny Portage/Johnstown PA, Matthew chose the Adena Burial Mounds as a must-see, and Celia wants to go back to the Cincinnati Museum Complex. She has been asking to go back since we were there in 2009, and really - we have so many museums here, there's no reason to drive all the way to Ohio. However, since we need to pass through Cincy to go to visit Isaac, we're making a stop. She can't wait, because not only is her "wish coming true," but she's getting to learn about Cincinnati, the town where (American Girl) Kit Kittredge "lives"! We are waiting to fill out our pages for Kentucky, because Jude wants to wait to see what Isaac wants to do with us, and will continue filling out pages for later stops after that. At the back of the book is the section called "As I See It." It's a way to informally document something. Maybe you haven't gone to a big destination, but your "field trip" is a nature walk and you'd like to draw what you've seen. There are several pages with theme prompts such as "Reflections and Shadows," "Predators and Prey," and "Heavens". There are also several blank pages where you can draw with your own inspiration. As much as I think we will enjoy this book, I see a few shortcomings. First, I wish this had a way to add extra pages for more trips. Even as a shared family journal, we are going to need two more journals to be able to log everything on our trip. I know that a giant trip with nearly 30 places to visit in one month isn't the norm, but if you're a family that likes to do a lot of traveling, this book will fill quickly. Many families I know do one field trip each week; even at a one-trip-a-month pace, the book may not hold a year's worth of memories. It seems a waste of paper to get a new journal with hints and preparations pages when all we really will need are the trip pages - a 3-ring binder and refill pages (like a Dayplanner style) would be more practical if you go on frequent field trips. I also wish there was some sort of envelope/folder so the student could keep mementos (entry tickets, etc. ), or a third page for each trip for pasting tickets/photos. There is ample room on the page already provided for if you have a student who wants to write a paragraph or two about the trip, or for a younger student to place a picture or two in response to the prompts, but not for both. Overall, we like this journal. We wish it had a bit more room for more frequent field-tripping, but if you take field trips only once in a while, it could last an entire school year. Until now, we hadn't really considered keeping an "official" field trip journal, but I think it's going to be a fun addition to our trips! We're looking forward to writing about what we've seen, and coloring the states we haven't yet visited.